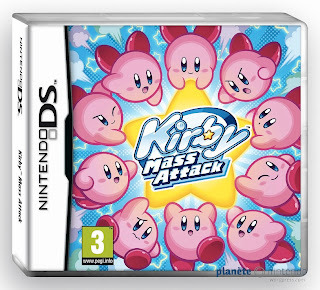 Did you know that the European box art for Kirby Mass Attack combines elements of the game's Japanese and North American covers? If not, well, you do now. Specifically, the game's Euro art, which can be seen below, combines the "circle of Kirbys" illustration that fills most of the Japanese cover and the stylized logo that's front and center on the North American cover. Did the designers at Nintendo of Europe produce the ultimate piece of Kirby Mass Attack box art, or do you prefer the covers that were made for the Japanese and/or North American versions (both of which can be seen and commented on here) of the game? Although I'm still quite fond of the game's North American box art, I'd be lying if I said I couldn't see the appeal of its European and Japanese counterparts. I just have a bias for Japanese text. So whichever boxart has that on it wins, really. I just prefer it aesthetically compared to the english alphabet. I mean I know Japanese uses english a lot but, y'know what I mean. I played a demo via the Nintendo Channel and I'm sold. It's cute and fun. Unfortunately, I just spent $30 on season 2 of Glee, and we're going to Cedar Point at the end of this month, so...it'll have to wait a tiny while, I think. Yeah, I keep hearing about that damn demo :( I'd download it myself, but I can't easily connect my DS via Wifi (long story). So, I'll just have to take everyone's word that it's fun. Anyway, I'm in the same boat as you -- won't be able to get this for a bit. Oh, well!